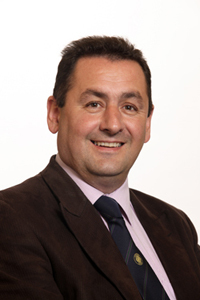 Mourne’s Sinn Féin Cllr Willie Clarke has again called for a date for the commencement of road safety improvements to be carried out on the North Roundabout in Newcastle. There is an urgent requirement to replace the out-dated zebra crossing with a puffin lights crossing. Councillor Willie Clarke concerned about road safety at the North roundabout in Newcastle. Cllr Clarke said: “I have written to Mr Simon Richardson, Divisional Roads DFI manager, seeking a date for the replacement of this dangerous zebra crossing. “Every week I am contacted in relation to near misses at this location with many involving mothers and young children whose lives are being endangered by motorists driving through the crossing while pedestrians are walking on it.